HIJAB 'N' THE CITY: YOGA anyone?? Hellowww!! Few years ago, I have written for two magazines. Both were on Yoga topics. I was excited in having my very own column so I wrote away... (If you are wondering , that my grammar is not an oxford university material, and how could she be a writer, that was because my articles were proof read before it was published! Now happy??). My excitement crushed because both of my columns which were supposed to be about YOGA should be a matter of facts and serious and must follow strictly on topic requirements by Editor! Owww that was the end of my excitement (Plus they didn't let me have a cool column name like 'Yoga and the city'? perhaps? ), err by the way, aren't plenty of yoga books in Borders if people want to read facts? Something disturbed me today ...an old school mate, contacted me a few days back to join my private yoga class! (blessed her for her will to learn) I was a bit disappointed when her husband said it is haram to learn yoga! (Thanks to the media hyped of 'Yoga is haram' in Malaysia a few years ago and although it was declared permissible, damaged has been done unfortunately). But nevertheless, his opinion is respected because I blamed it on the media! That get me into thinking or analyzing (again)of the many times people exercised haram things when they thought people are not looking?? Taking bribe and dismissed it as a 'gift'? Married two women but could hardly afford them? 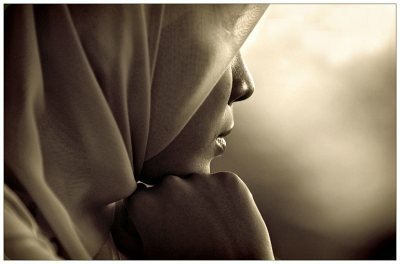 Lusted after another woman while forcing wives to wear hijab? Have plenty but will not do zakat or sedekah? Left behind children because they could?? Shouted foul languages and beat the crap of a wife right after an Isya' prayer?? Are these people hiding behind a pillar so fake of a hypocrisy mask of a learned Muslim? Blamed on his daughter's extramarital affairs on her good friend who has no hijab on as bad influence! (because the said girl wore hijab)?? Let me laugh again when they said yoga is 'haram' due to it's origin and the mantra that comes with it! Mantra is Sanskrit word that means 'zikir'... Are we Malaysian Muslim so weak as to get influenced that easily? Shouldn't we analyzed first and then judged and not the other way round? To me and many of my yoga students not forgetting my dear husband Peter, "Sisters in Islam' Malaysia kini, Aljazeera and my friends who have stood behind me in the year 2009 when they tried to ban yoga, I say, hallelujah!! we are practicing yoga because it is good for our MIND, BODY and SOUL! Wow. I never in a million years thought of practicing yoga as being against one's religion. I guess that shows ME the stark differences in living in America and living in Malaysia. I think it goes to show that Christians could take a page from your book and really look at the various ways in which they are practicing haram against his or her religion without realizing it. Interesting post, it makes me sad that something that can achieve so much good health for someone can be thought of as bad and wrong. Good for you for being strong!